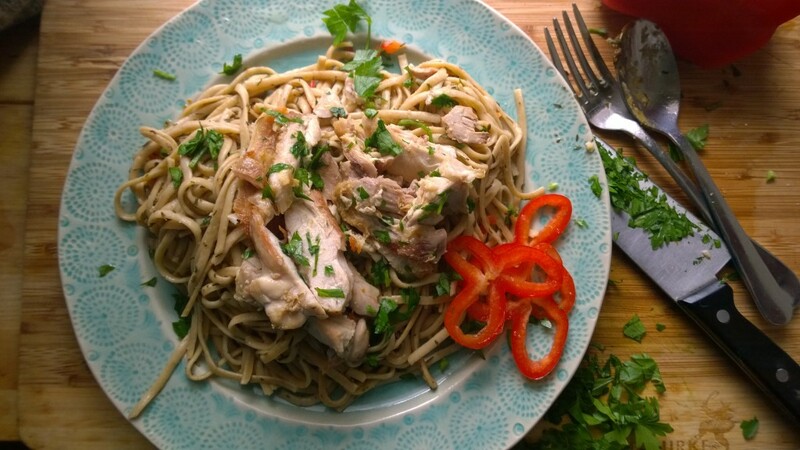 Home From Erika's Kitchen	Why Should You Choose Whole Wheat Pasta Over White? I’ve learned to love my whole wheat pasta. I also know that this is considered sacrilege. When I lived in Miami Beach, I lived near this place that sold hand-made pasta, fresh, still yellow from the egg yolk and a slight tint of brown from the unbleached flour, called Mr. Pasta. It wasn’t as cheap as the stuff we could’ve easily bought from the grocery – at $3 a package, it was over twice the price – and it was a tad bit out of the way, but when we decided to spend the extra cash (I’m not ashamed to admit money was tight! ), it was well worth it. 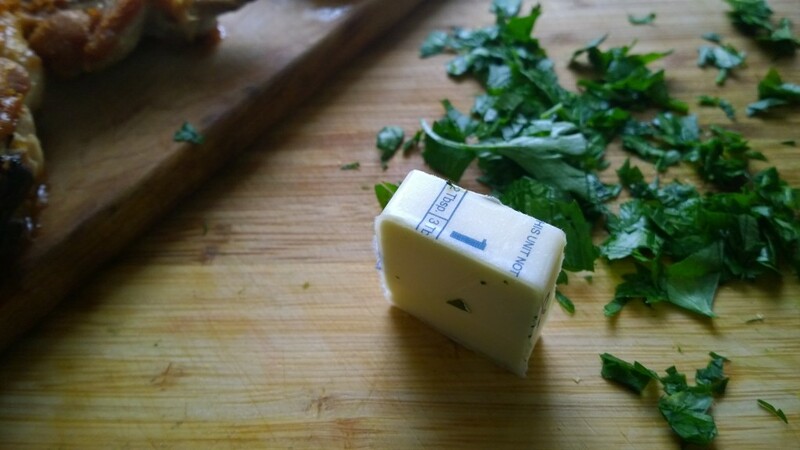 We used to buy flat sheets of pasta, and Eddy fashioned a pasta cutter out of a drinking glass so that we could make ravioli stuffed with our favorite cheeses and herbs. My first taste of gnocchi (an entirely different story), my first experience with laganelle (the noodles we use to layer lasagne), and the very first indulgent pappardelle (very wide, flat noodles, similar to fettuccine) I’d ever had were all courtesy this little store on the island. 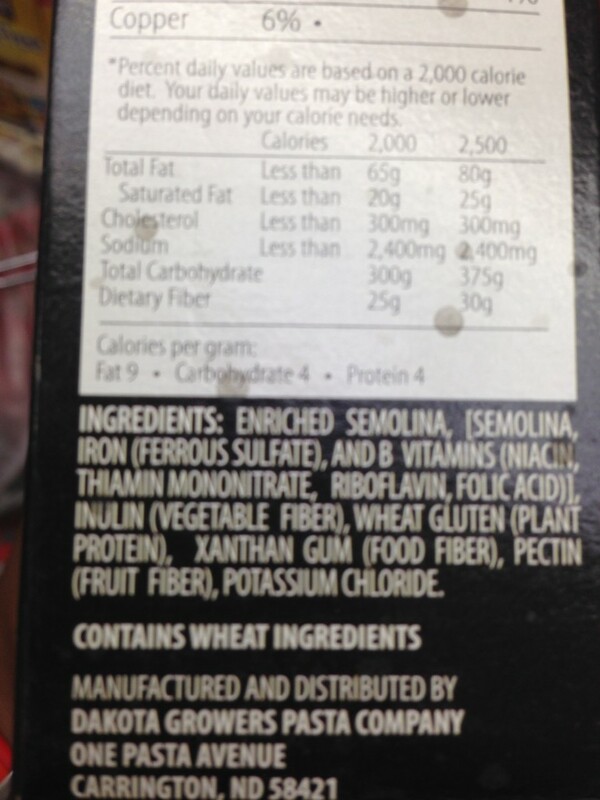 …and that’s why the ingredient labels for some of the pastas available at the grocery store are so disturbing. The lengths to which manufacturers must go in order to make pasta that can sit on the shelves until you bring it home, are frustrating. 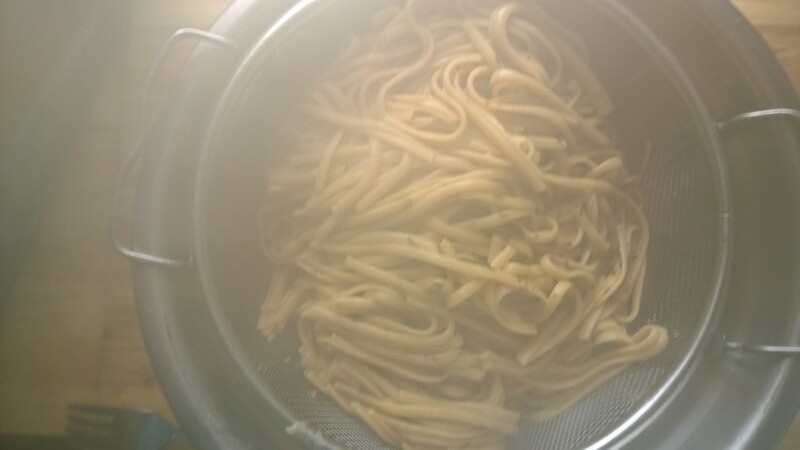 The protein is stripped out of the pasta, as is the fiber, since neither of those are shelf-stable in this form. However, since that’s where most of the nutrients are in grain, they have to be added back in – enriched – to the dough. Hence, the thiamin, riboflvin, and folic acid. Some labels that I’ve seen make reference to using durum or semolina flour, but the minute that you see “thiamin, riboflavin, iron” in the ingredients list, you know you’re dealing with a bleached flour. (For the record, bleaching is a totally unnecessary process.) The ingredients list is rounded out with inulin, a form of sweetener that also has the added effect of functioning like a non-fibrous laxative; xanthan gum and pectin, which are less like a fiber and more like a thickener; and potassium chloride, a salt substitute. Fresh pasta is a treat, but a rare one. This is why, if I can’t get good fresh pasta, I go whole wheat. That’s right – I said it! 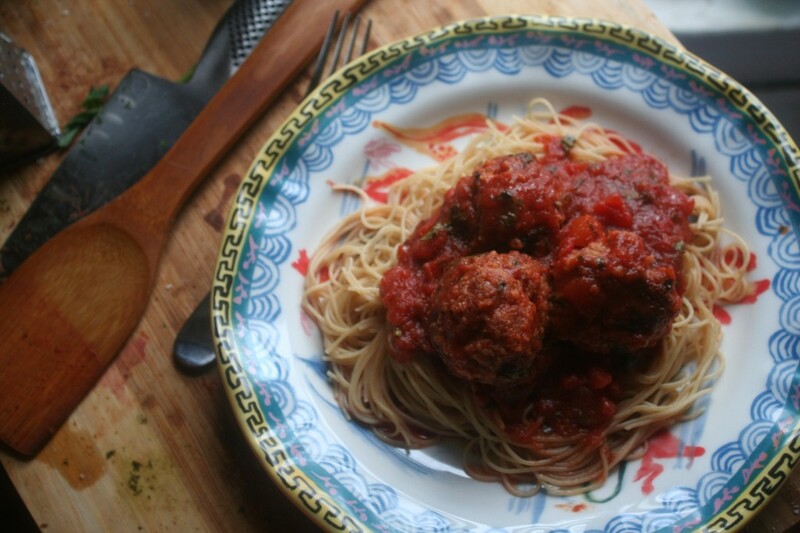 Now, pasta serves other purposes besides stuffing you and giving you that “ahhh” feeling. Pasta is now helping you rebuild muscle fibers from training, replenishing your energy post-exercise, and helping you cleanse your colon by sloughing out all the nasty stuff with that fiber. These carbs…are helpful. Except, as I was told before… they taste like cardboard. Oh, no…that won’t do. Let’s see what we can do about that. Grab your giant pot. Fill it up with four quarts of water. Inside, we’re going to drop some herbs that boil well, as well as some celery seed. 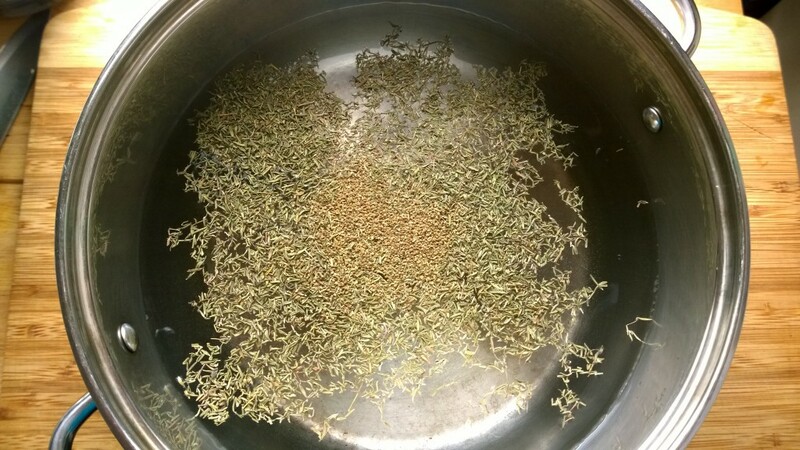 I always keep celery seed on hand because they give me a flavor resembling stock made with fresh celery, but without the taste or the time it takes to actually make stock. You’re going to use a lot of water in this because you want to give the water some time to heat the herbs and extract their flavors. 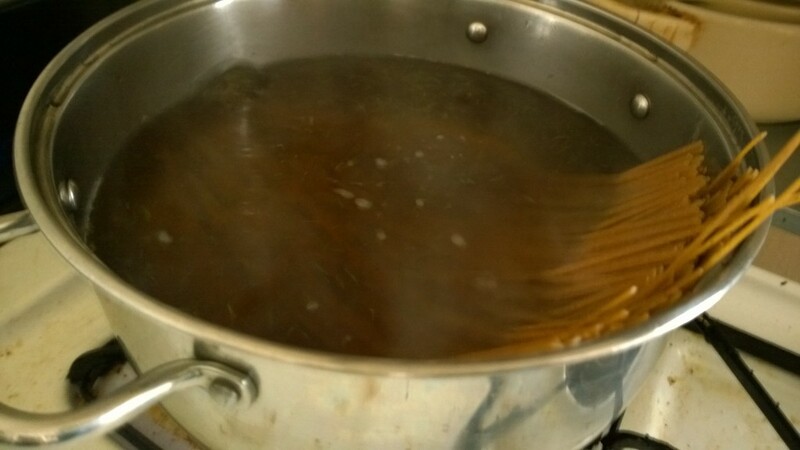 Once the water comes to a boil, you’ll add a full teaspoon of salt to the pot. 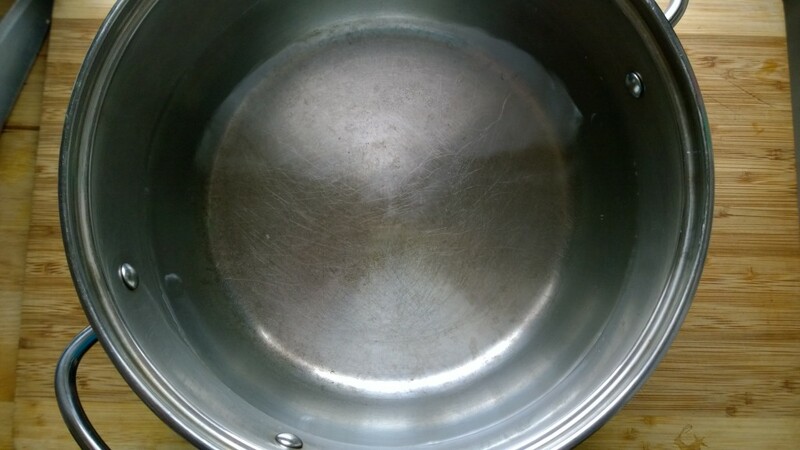 Once the water is at a rolling boil, meaning it’s boiling so high and hard that it’s forming giant rolling bubbles at the top, bust out your pasta and drop it in the pot. 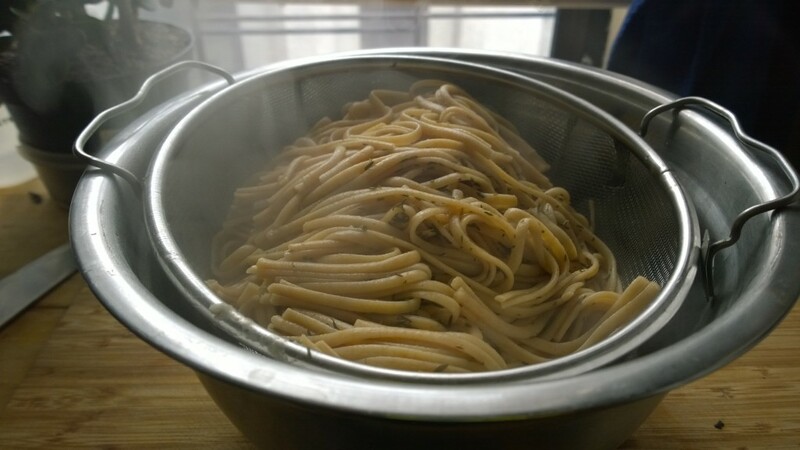 (And, by “drop,” I mean “very carefully place.”) It should stop boiling pretty quickly, because the presence of the pasta lowers the temperature of the water in the pot. Meanwhile, get your other ingredients ready. 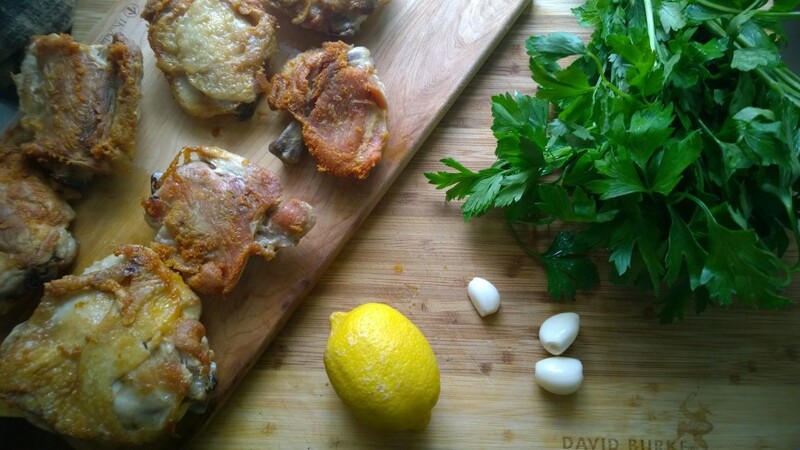 Over here, I’m adding cut chicken thighs to my dish – what can I say? It was a post-workout meal! – as well as parsley, lemon juice, garlic, chopped red pepper, butter, and – get this! – the pasta water. Sounds weird, right? Trust me, it’s delicious. One of the reasons we seasoned the pasta water is because the pasta actually soaks up that flavor that we extracted into the water. One of the other reasons we seasoned that pasta water is because, whenever you’re cooking, you always want to add as little plain water to your dish as possible. Adding plain water always takes away flavor – it never adds any (unless it’s New York City water and bagels, but that’s a-whole-nother story), and it only dilutes and “waters down” your flavor. When it comes to cooking pasta, it’s no different. 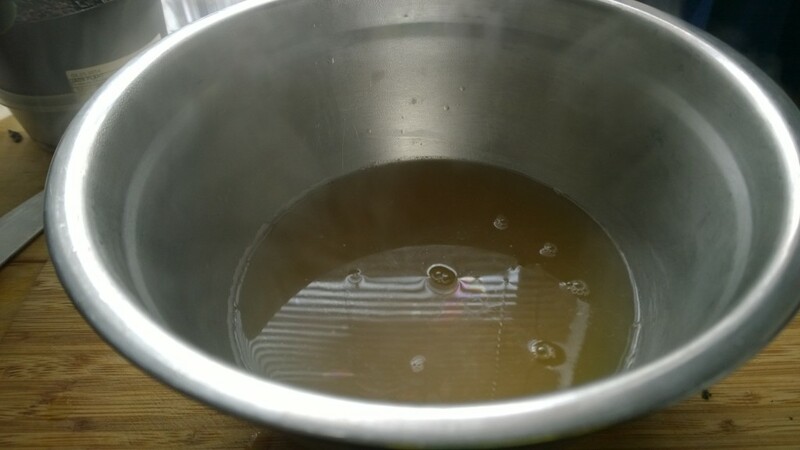 The third reason why we seasoned the pasta water is because it essentially becomes a broth for you to make a delicious sauce out of using some fresh ingredients. Many sauces are based using cream or wine, and not only do I not have those in my kitchen tonight, but I also don’t want those ingredients in my meal right now. I want this to be as light and flavorful as possible. Using the sort-of-some-what-broth I made with the pasta water will help with that. We’re going to make this using a colander and a heat-resistant mixing bowl that’ll help us capture some of the pasta water so that we can use it in our sauce. 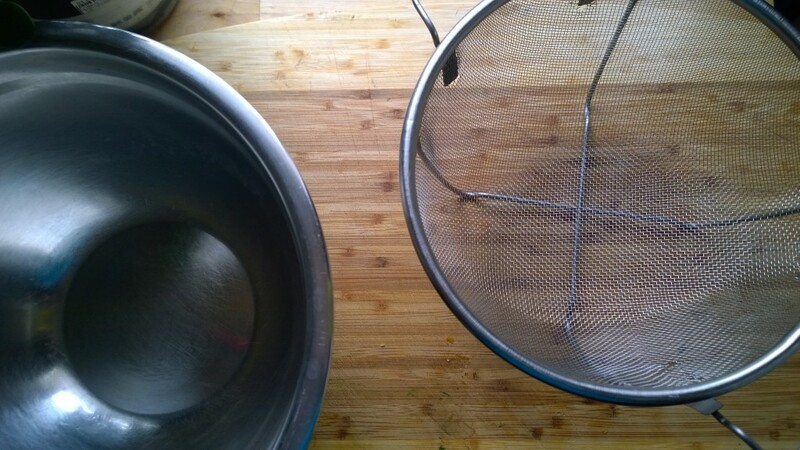 When your pasta is finished – it usually takes around 12 or so minutes – you’ll place your colander inside of your mixing bowl, and then carefully pour your pasta into the colander. Use your colander arms to lift it out of the mixing bowl, leaving nothing else except the starchy seasoned broth you used to cook your pasta. 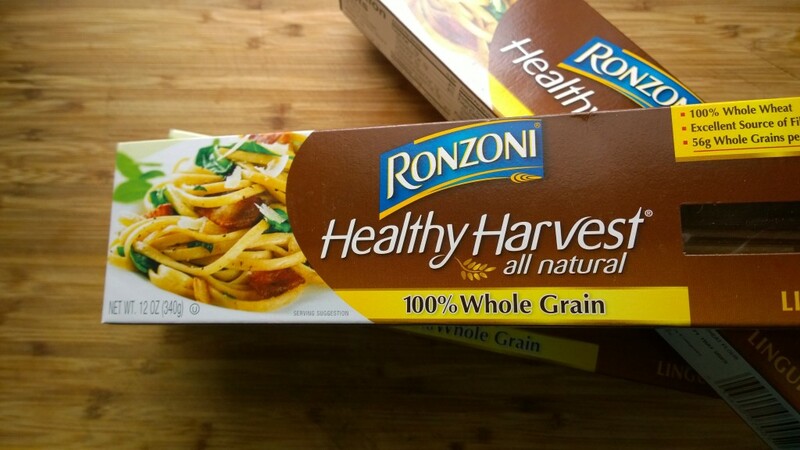 The secret to good pasta – wheat or white – is what you put on it! A good sauce, fresh flavorful veggies, and carefully pinched salt can make a world of difference in how we experience the food on our plate. 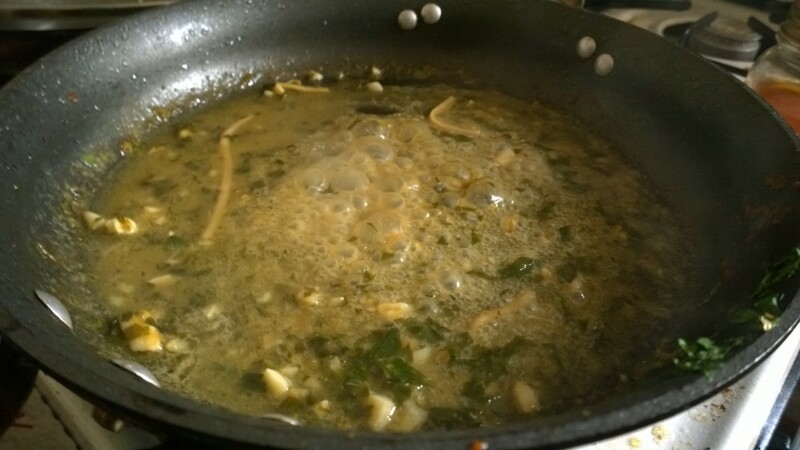 Here, I’ll share with you a quick sauce I make when I’m tired and am unwilling to spend a half hour in the kitchen in front of a hot stove. 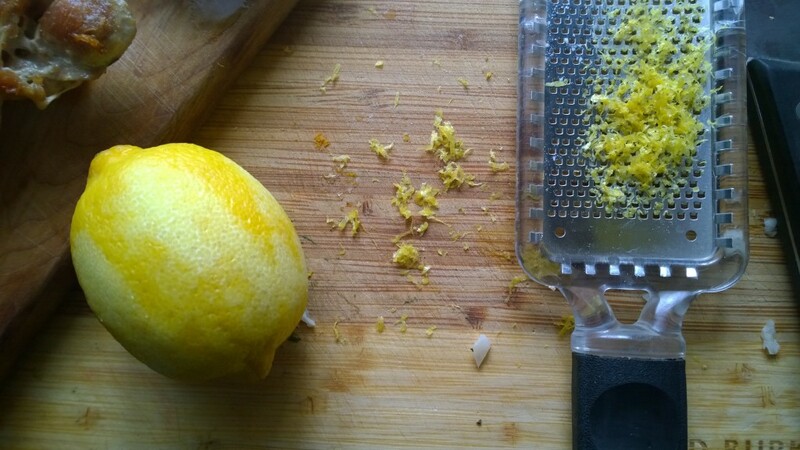 …the juice of a lemon (and the shavings, as pictured, if you have something that will shave it finely enough! ), and a finely cut red pepper. Toss it into the skillet, and let it simmer with the broth. 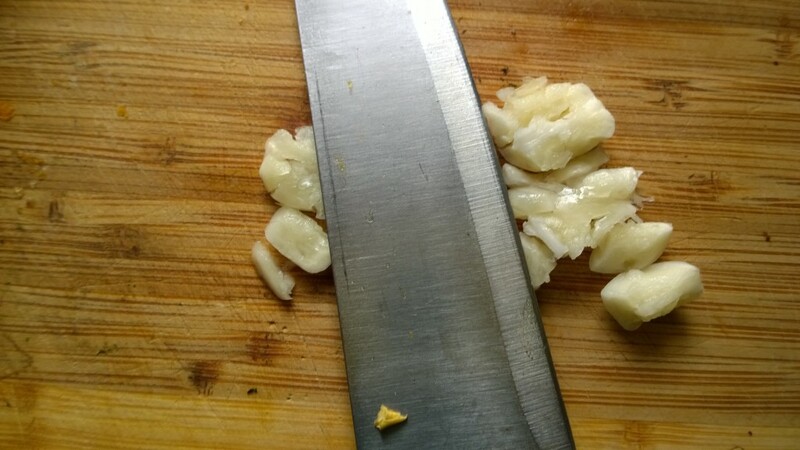 Remember, we shouldn’t need to add salt to this sauce, because we added it to the broth before we put the pasta in it. Looks disgusting, tastes delicious. This is my skillet before the diced red peppers. Take your pasta, and put it back into the empty pot, pouring the sauce you made all over it. Swirl it all around, soaking up as much of the sauce as you can with the pasta. At this point, I’m going to chop my chicken and rub it in chopped parsley and a little salt. Grab your plate. Put your pasta on it. (Add your chicken, if you’ve got it.) Sprinkle a little bit of leftover parsley and a teeny pinch of salt and a last squeeze of that lemon over the top. 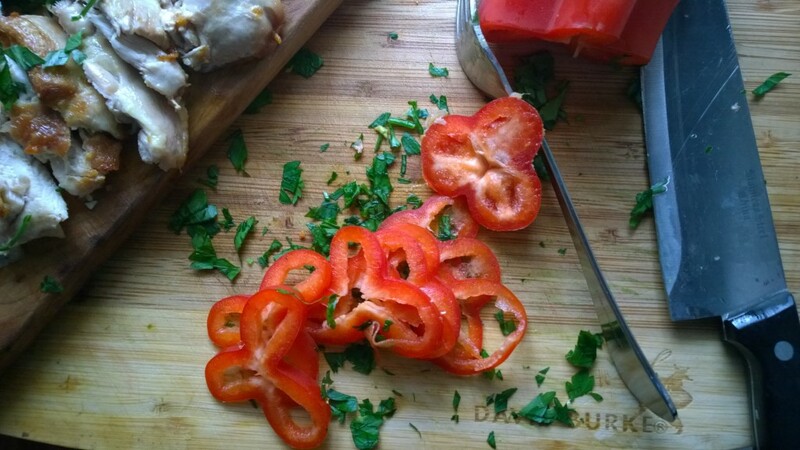 Cut off the rounded edges of your red pepper – something I always do – into thin petal shapes, and adorn your plate with them. Because you’re fancy. Eat it up. Because you’re hungry. At least, I know I am. Or add meatballs. Because you clearly need The Monster Dinner. See I had taken to simply avoiding pasta altogether unless I was carbo loading for a race. I actually prefer the taste & mouth feel of whole wheat pasta over white. Same thing happened when I transitioned away from white rice; prefer brown now. I’m going to try this method of seasoning the pasta water with more than salt. While I like the ww pasta, my family still prefers white. They don’t get to eat it (bc I’m too lazy to cook two separate noodle options) but maybe they’ll learn to like the pasta instead of only tolerating it. Ah, I never considered it may be a texture issue. I’ll give that trick a try if the ww pasta still doesn’t go over well after trying the method you’ve outlined here. Thanks for sharing this info; quite helpful for me as I never really learned how to cook. I just follow directions and hope for the best lol! I grew up on homemades..pasta, pasta, pasta..I could eat it 3 times a day..I like pasta like some people like chocolate or crack..yes for me its that serious. And no pasta was complete without that mountain of Parmesan cheese..ahh the memories..I eventually weaned myself off the white stuff and went to whole wheat..then I gave it up completely. Now I only eat it on my son’s birthday..he loves stuffed shells..hurry up December lol. Have you tried Quinoa pasta? I’m wondering how much healthier it may be than whole wheat, and if the taste and texture are the same.